Our vision is a world with thriving fish and wildlife in natural habitats enjoyed by today’s population and preserved for tomorrow’s generation. Bisbee's Fish and Wildlife Conservation Fund believes you should understand how your dollars help us achieve our mission. We maintain 100% transparency and consider our financials to be public information. 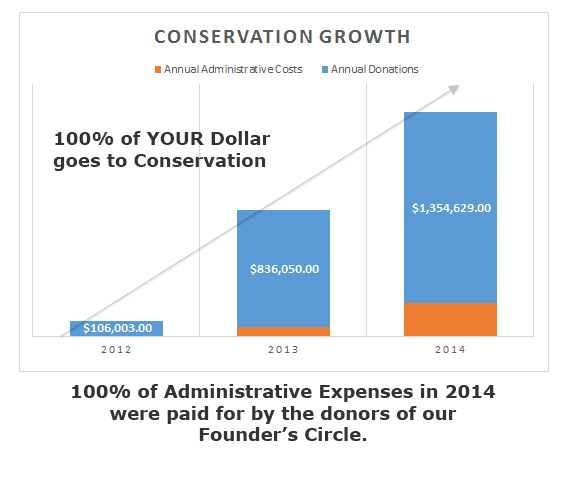 As of January 1, 2014, the donors of our founder's circle have agreed to cover 100% of our general and administrative expenses so that every penny of your donated dollars are allocated to the support of wildlife conservation. This means that 100% of your donation goes directly to our conservation projects and not to operational costs. We believe you should have the ability to pick and choose which of our current projects your dollar benefits. For a list of our current projects, please visit our Conservation page. Our organizations strong performance is recognized by Charity Navigator as exceeding or meeting industry standards. We meets all of the Better Business Bureau (BBB) Wise Giving Alliance Standards for Charity Accountability. In addition to exceeding the expectations of non-profit verification services, we believe you should be able to take a look at our annual reports and financial statements. Administrative expenses are a reality for non-profit organizations. Staff salaries, mailings and program costs cannot be avoided, yet the top-rated groups consistently minimize those percentages and dedicate the majority of funds raised to the overall mission. Bisbee’s Fish & Wildlife Conservation Fund, a Texas-based non-profit celebrating fish and wildlife, has gone one step further by establishing the Founder’s Circle. Charter members of the Founder’s Circle have agreed to cover 100 percent of the organization’s general and administrative expenses so that all additional donations are strictly allocated to support wildlife conservation. “Certain administrative costs are unavoidable, but with this approach we’re guaranteed to get the most bang for our bucks. In addition to inviting other dedicated conservationists to donate to the Fund’s specific projects, individuals who are sensitive to the General & Administrative needs may also join our Founder’s Circle to help us make a difference,” says R. Wayne Bisbee. To learn more about the Fund’s projects or to join the Founder’s Circle, please contact us by email at team@bisbeesconservationfund.org. If you have any general questions about our organization, please contact us by using the contact form on our contact page.